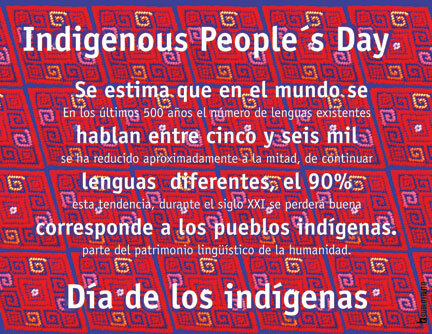 The Indigenous People’s Day poster project was a collaboration between M.E.Ch.A. de San Joaquin Delta College and Sublevarte Colectivo, on 2005. 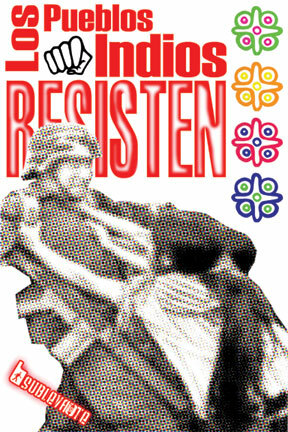 The posters were created by Sublevarte after an invitation by M.E.Ch.A. 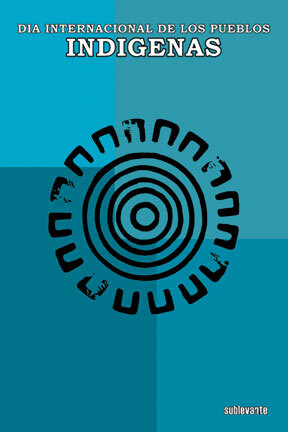 to do artwork for a cultural event organized at Delta College. 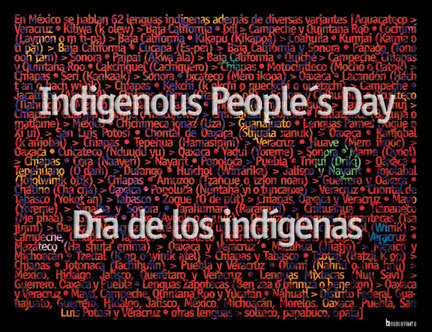 The event, called Indigenous People’s Day, was a celebration of the contributions of the original peoples to the world, and their resistance to colonialism. 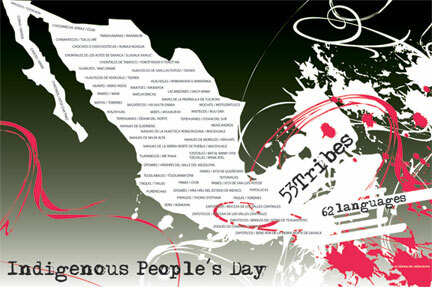 There are many contributions of the original peoples of the Americas to the world. We find them in the form of foods like corn, beans, squash, tomatoes, peppers, cacao, and more. As well as in math, with the use of zero. In science, with the use of medicinal plants, and more. Nevertheless, Eurocentric mainstream culture dominates our society, and as a result, we tend to hide or minimize the influence of indigenous cultures on modern life. Even more, around us we can see many examples of cultural appropriation that disrespect indigenous peoples, as well as flagrant discrimination and racism towards them. 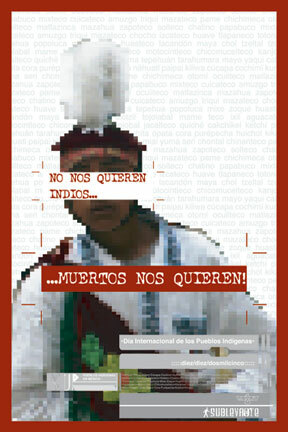 In this context, it is necessary to work on projects to educate people about the richness of indigenous cultures. 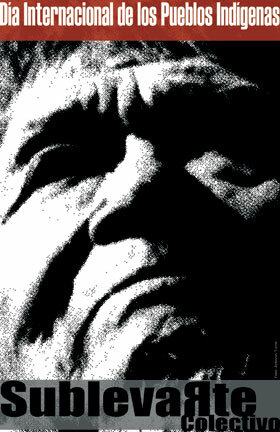 Art by itself is not going to change the way the world works, but it can inspire people to do something. 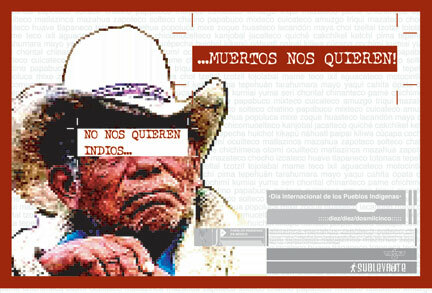 The posters do not provide answers to the problems faced by indigenous peoples, but they invite the viewer to learn and critically think about them. 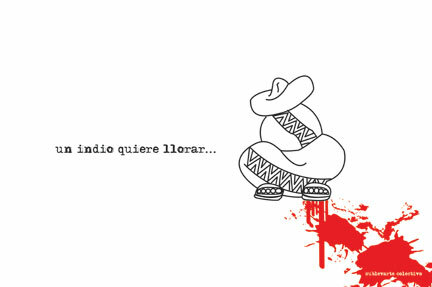 Besides, the project was an opportunity to show the artists’ interpretations of the cultures and struggles of indigenous peoples in Mexico. Working as a collective infuses diversity in a project, and the posters are a good example of it. 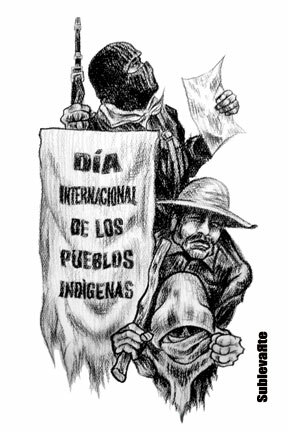 The artworks show a great variety of styles to present the issue; from images making reference to ancestral cultures, to representations of nowadays Mayan ethnic groups organized under the name of Zapatistas. 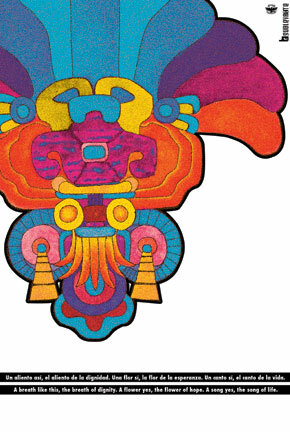 (1) Most of the artworks are figurative, yet there are some abstract creations. The posters show a diversity of mediums like photography, drawing, painting, and digital illustration, and combinations of two or more of them. Some artworks show the use of saturated bright colors, while other artworks rely more on the use of gray scale. Also, some posters show the use of typography to create an interesting visual texture. 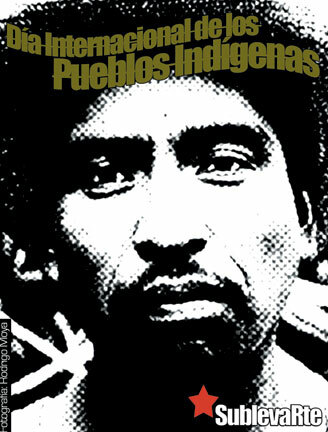 The posters were shown at San Joaquin Delta College, and later at University of the Pacific, in Stockton, California, during a cultural event that included visual art, poetry and music. 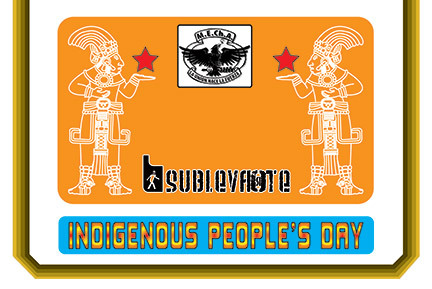 The Indigenous People’s Day poster project, was a great opportunity to show how people from different countries can collaborate without borders to enrich the human experience in the path to create a better world. 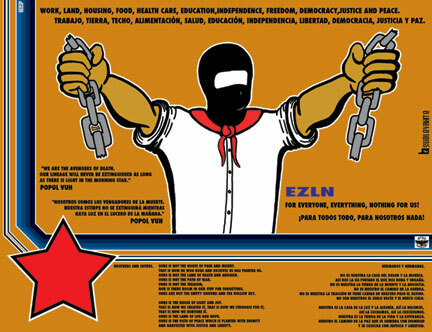 1– The Zapatistas are a group of indigenous peoples in Chiapas, Mexico, who are struggling for dignified life. 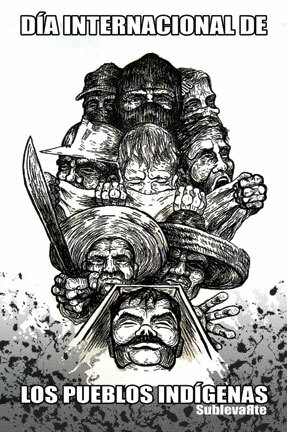 Some of their demands are: peace, justice, democracy, and freedom.